From time to time, you have to do some boat cleaning. Not my favorite job, but the yacht looks like 'a million bucks', don't you agree? 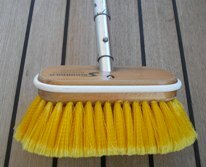 Now, alltough cleaning your boat is fairly simple, you need to have the right technique and the right boat cleaning tools. Always start at the top and work your way down. Then, you begin at the bow and move towards the stern. These are the basic rules. I do look at the wind and the sun too. If you see that the wind is coming from a certain direction, you start cleaning upwind and then further downwind. Otherwise you're only wetting the surface again that you just cleaned. If the sun is shining strongly, you need to be sure you're cleaning quickly. Always hose down the surface, before you come with the boat wash and brush. Rinse it off well afterwise and mop the surface, to avoid waterspots. Like I do, you probably also have limited space on board. There's just too much stuff on board or there's not enough room in the lockers. Both are true. 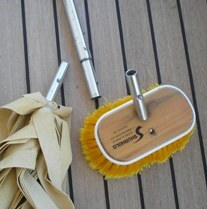 So, it would help if we have good quality cleaning tools that last long and that take a minimum of space on board. 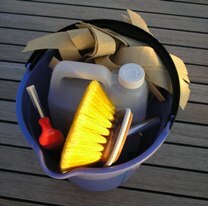 This is why I like the Shurhold boat cleaning items. For example, they have the telescopic handle. One handle that you can make longer or shorter whatever the length you need. And through a quick-lock system you can put several accessories on it. So, one handle, multiple functions! Sounds great, doesn't it? You decide which kind of brush. They have several sizes and levels of softness. Depending on the surface you want to clean, you choose soft, medium or hard. There's a lot of choice, so I'm sure you'll find the right one for your boat! I have used the Shurhold products over the last years and they have proven to me as high reliable. These quality products are the best on the market! You need a bucket too, of course. All the cleaning accessories can fit in the bucket, so that with your 1 handle is all the place you need for your cleaning equipment. 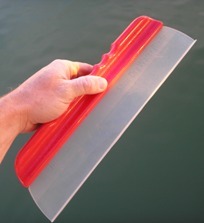 For wiping the windows or to get water from a larger surface, I use the water blade from Shurhold. Together with the synthetic leather from Vinalon. Makes it much quicker to dry a surface! Do you know that Shurhold offers complete boat cleaning kits, so you only have to buy one time to get all the necessary tools at an attractive deal price! 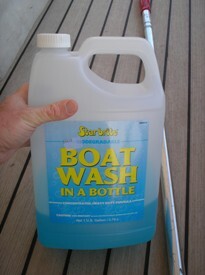 When I wash down the boat, I prefer a proper boat wash. I sometimes do it with dish-washing fluid, but that's only when I run out of the good boat wash.
Boat wash is specially made to clean your deck and everything around it. It washes off salt, dirt, grime... much more than a kitchen soap will do.